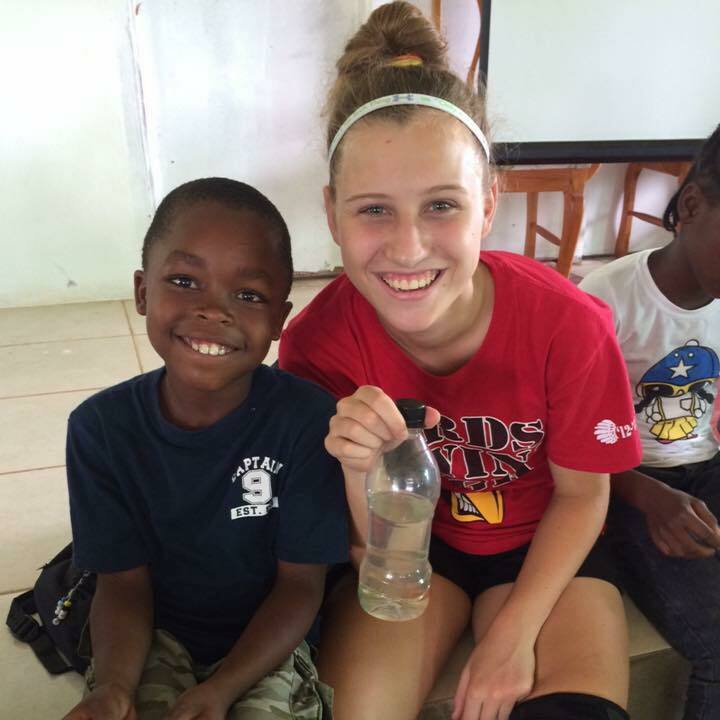 My daughter recently had the opportunity to go on a mission trip with a group from our church. Sending your child off to another country isn’t necessarily the easiest thing to do and for her birthday to be while she was gone just added to my concerns. From the day my first child was born I have considered myself just the caretaker and that my children are first and foremost God’s. God has just given my husband and I the honor and responsibility of caring for them. Knowing that she was going to serve, give to others, and that she was with an amazing group of people actually made sending her off fairly easy. Social media has it’s faults, but one of it’s good qualities was getting to see the pictures from the trip roll across my news feed daily. Of course I did a lot of creeping on the pages of those who were on the trip to get any information I could as well. The day of her birthday this sweet picture came across my Facebook news feed. As I got more of the story I learned that this sweet young man had stopped and caught a fish as a gift for Michaela. He wanted to give her something so he gave what he could and what he had. You can see by the glimmer in both of their eyes that this gift brought so much joy to each of them as it did for the entire mission team. Last Sunday evening our church had a service for the team to share about the trip. The fish from Lonzo was mentioned as was the generosity of these children who have very little to give. What is given to them they often turn around and give right back. It was mentioned that Lonzo walked thirty minutes up a mountain to go to the Vacation Bible School being held by our group. He had worn out tennis shoes and often wore the same clothes. As I listened my heart was touched even more by this sweet boy’s generosity and how he put such a great smile on my daughter’s face. We can’t bring Lonzo to our home, but the thought occurred that we can get another fish. Michaela’s fish Jerry was unable to make the trip home. At the first opportunity I went to the pet store and purchased a small fish bowl and fish as a surprise. My one request was that we name the fish Lonzo. The look on my daughter’s face said it all as she saw the fish and heard its name. Our eyes connected for what seemed like minutes and her look said it all. It was a heart warming momma moment that seems more and more rare the older she gets. We have done well caring for our turtles and our dogs. Fish on the other hand, we have a few things to learn so we will most likely have Lonzo 1-100, but it is the thought and the memory that is the true gift. Lonzo’s actual gift was short term, but his thoughtfulness, generosity, sacrifice, and joy he gave is eternal. The little boy who wanted to give so he gave what he had and all that he really had to give.